"Lester P. Seaver, 52, who resides 1-1/2 miles south of Milan on Route 67, was found dead shortly before 6 last evening in the cellarway at the rear of the State Furniture Co., 1134 Fifteenth avenue, East Moline. "Neighbors reported that a noise was heard in the alley and Walter E. Crow, who lives in an apartment above the store building, investigated. He reported that he found the body of the Milan man at the foot of the stairway. Coroner Leslie Banning, investigating the death, said this morning that Seaver apparently had fallen down the 14 cement steps of the stairway. Cause of Seaver's death was not determined immediately although it is believed he may have suffered a heart attack. "East Moline police and fire departments were called but efforts to revive the man with a resuscitator failed. It was not learned what Seaver was doing in the alley at the time of his death. "The body was taken to the Crummy funeral home, Reynolds, where an inquest was scheduled to be held this afternoon. "Funeral services will be held at 2 Monday afternoon in the Crummy funeral home, the Rev. Roy E. Stocking, retired Methodist minister, officiating. Burial will be in Memorial Park cemetery, Rock Island. Friends may call at the funeral home after 6 tonight. "Lester Philip Seaver was born in Taylor Ridge, Jan. 21, 1898, a son of Jacob and Anna Seaver. He attended Rock Island schools and normal school in Moorhead, Minn. He resided in Rock Island county all of his life except for 10 years when he lived in Minnesota. "Mr. Seaver was a veteran of World War 1. He was a member of the Rock Island Eagles and the Congregational church in Moorhead, Minn.
"Surviving are the widow; the parents in Reynolds; a brother, Douglas B. Seaver of Milan; a niece and a nephew." "Milan Man Found Dead at Foot of Stairway in Alley," obituary, The Dispatch [Moline, Ill.], 28 October 1950, Page 3, column 1, Lester P. Seaver obituary; digital image, Newspapers.com (https://www.newspapers.com : accessed 29 November 2018). The obituary provides his full name, birth date and residence address, does not name his spouse, and names his parents and brother. Apparently, he had no children. You would think that the funeral home would choose a more dignified name...perhaps it was named after a person. Lester Philip Seaver was born 21 January 1898 in Taylor Ridge, Illinois, and died 27 October 1950 in Moline, Illinois. He was the son of Jacob Allen Seaver (1868-1962) and Anna Clarke Bendle (1867-1959). He married Ada Faye Wakefield (1900-1988). I had Lester and his wife and his Seaver ancestral families in my RootsMagic family tree. 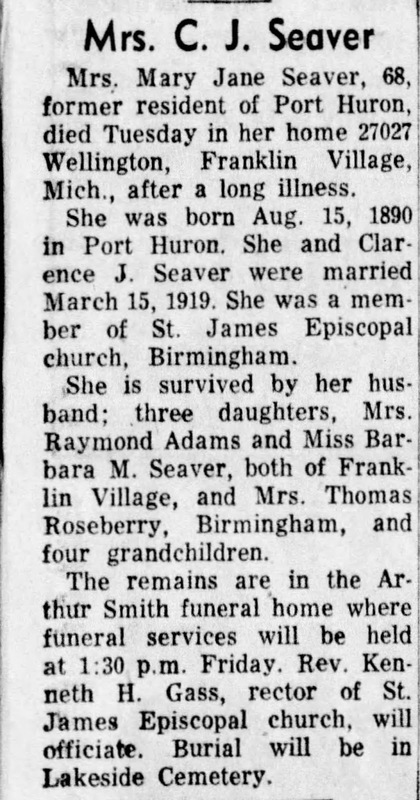 I am not related to Lester Philip Seaver - his great-grandparents, Jacob and Esther (Croberger) Seaver were born in Virginia, and settled in Switzerland County, Indiana.